Chandigarh:- Sikh Political Prisoners Bhai Jagtar Singh tara is reportedly refused to contest his cases in Indian courts. While talking to media person Advocate Simranjeet Singh of Chandigarh, who reportedly met Jagtar Singh Tara in Burail Jail, said that Bhai Tara has told the court that he does not believe in Indian Constitution and he has nothing to say to the court in Burail Jail Break case. Notably Chandigarh administration has granted permissions to prosecute Jagtar Singh Tara in Burail jail break case. Jagtar Singh Tara is also facing trial in Punjab CM Beant Singh assassination case. It may be recalled that Jagtar Singh Tara along with Jagtar Singh Hawara, Paramjit Singh Bheora and another had escaped from Burail jail Chandigarh in 2004. He was arrested by Thailand police earlier this year, after which he was deported to India. 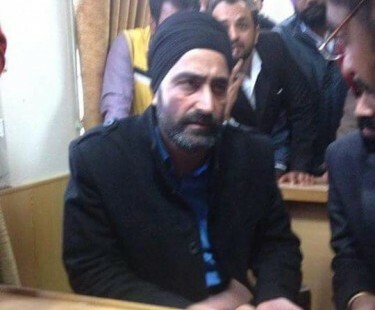 Advocate Simranjit Singh told that the chandigarh administration has allowed Jagtar Singh Tara to meet his relatives, other than blood relations, only after seeking permission from court. While talking to Sikh Siyasat News over phone, Advocate Amar Singh Chahal said that Jagtar Singh Tara had already refused to take any difference in CM Beant Singh assassination case declaring that he had no faith in Indian Constitution.